X Mode on the new 2014 Forester is all about getting down and dirty and it will involve some off-road fun that involves a few extra hands at the car wash. Subaru is appealing to a new generation of younger buyers and the new 2014 Forester will be purchased by millennials around the globe who enjoy active lifestyles. This will include off-road adventures and getting the new crossover covered with dirt as they take it into some extreme conditions. Most SUV owners never take their vehicle off-road, as they use it to transport kids to the soccer game and use it as a grocery hauler. 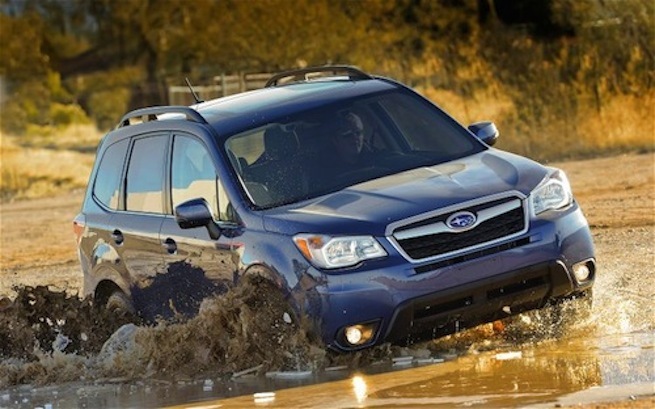 Motor Trend recently awarded the new Forester the Sport/Utility of the Year for 2013 for good reason. “Performance of Intended Function” was one of the key areas of evaluation MT looked at, and this included off-road pursuits that its owners will use it for. Subaru owners are a different breed and the Forester X Mode gives this group extra assist they will need for fun activities off the paved road. The new 2014 Forester is a global vehicle and X Mode will allow owners in North America, Europe, Eurasia and Australia to go through some extreme conditions and have some extreme fun. With a flip of a switch, X Mode is available and the fun begins. On typical SUVs, torque is not distributed evenly to all four wheels and one or more wheels can begin to slip and the vehicle can lose traction and get stuck in the snow or mud. But Forester’s X Mode will allow any driver regardless of skill level, to escape any extreme situation they may encounter. How does the traction system work? When the wheels begin to slide or slip, the X Mode switch located near the gear shift, allows the driver to keep his foot off the brake and let the system do the work. This allows the driver to keep their attention on the road. Subaru put the new system through extensive tests in order to make sure it would work in any conditions. They created a test road with different mock-ups to simulate rough and harsh roads around the world. Several thousand kilometers were driven by Forester test mules and their drivers to test the development of the new system. The test road was so rough, that Subaru limited their drivers to only 30 minutes on the extreme road. A new generation of SUV buyers have active lifestyles and are looking at using their vehicles for sports activities on the weekends. The new 2014 Subaru Forester with standard X Mode is the global vehicle that will handle extreme conditions and give owners the ability to get off the paved road. The 2013 Subaru Forester with high ground-covering ability of X Mode has the durability needed to make extreme fun in the dirt happen. These two guys in the video below show just how much fun it can be driving through mud and dirt in their Forester. But they may have a different goal in mind at the end. The video is marked private, chumps, and cannot be viewed.